Die Fragmente der Griechischen Historiker Continued. Part V: Die Geographen is part of Felix Jacoby’s original planned work Die Fragmente der Griechischen Historiker.Part V: Die Geographen offers completely new material giving the original Greek texts with translations and commentaries. This project is expected to be completed in 2019 and will consist of the fragments and testimonia of 96 Greek historians.Die Fragmente der Griechischen Historiker Continued. 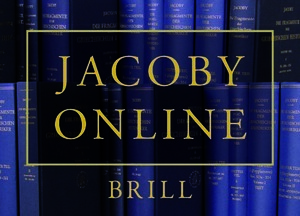 Part V is part of Jacoby Online – a unique reference work bringing together Felix Jacoby’s monumental Die Fragmente der Griechischen Historiker I-III, Brill’s New Jacoby, Brill’s New Jacoby – Second Edition and the completely new Fragmente der Griechischen Historiker IV and Fragmente der Griechischen Historiker V.